No one would argue that it is difficult to adapt quickly in response to unplanned increases in hiring demand. Nor would anyone suggest it's easy to keep an eye on what's needed to support long-term business goals when, for example, new site buildouts, unprecedented demand, or product launches shift attention to more immediate needs. 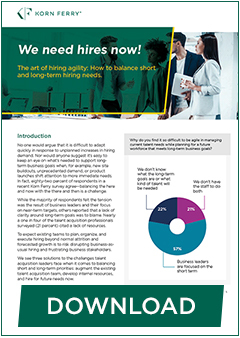 82 per cent of respondents in a recent Korn Ferry survey agree – balancing short- and long-term hiring is a challenge. In a survey of more than 600 talent acquisition professionals around the world, we sought to understand what's driving the tensions teams feel when trying to address these conflicting priorities and how some are looking for ways to better prepare and plan to ensure both needs are filled. 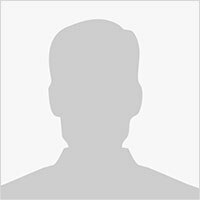 How can organisations respond to unplanned spikes in hiring volume? Hire for future needs now. Bring agility to your recruitment; download the report: The art of hiring agility.